Has anyone considered the fact that the water can be used to first drive turbines and then distributed to supply the input source for the heat pumps? I am a water turbine fan, and every time I spot a small hydro power plant on a hiking map, I have to find it. Pelton turbine. The small regional utility has several of them, the flow rate is typically a few 100 liters per second. The NSA should find an image of myself in the reflections. This does not mean I have developed intuition for the numbers, so I have to do some cross-checks. The tunnel produces a flow of 300 liters per second but this information is not yet sufficient for estimating mechanical power. The kinetic energy of a mass moving at velocity is: . From the mean velocity in a flow of water we could calculate the energy carried by flow by replacing in this expression by mass flow. … only, just enough for a small light bulb. If the cross-section of the pipe would be ten times smaller, the power would be 100 times larger – 1,35 kW. This is how commercial hydro power plants work, including those located at rivers in seemingly flat lowlands. 300 . 10 . 10 W = 30kW – quite a difference! Of course there are huge error bars here but the modest output of kinetic energy is typical for the topography of planet earth. Mass flow has to be conserved, and it enters both expressions as a factor. If I am interested in comparing potential and kinetic energies relative to each other, it is sufficient to compare to . But we cannot extract all that energy: The flow of water would come to a halt at the turbine – where should the water go then? For the same reasons there is a theoretical maximum percentage of wind power that turbines can harvest, even if perfectly frictionless. In addition, such a turbine would need to be much smaller than the cross-section of the river. Mass flow needs to be conserved: when part of the water slows down, it gets spread over a larger cross-section. So the realistic will be smaller. 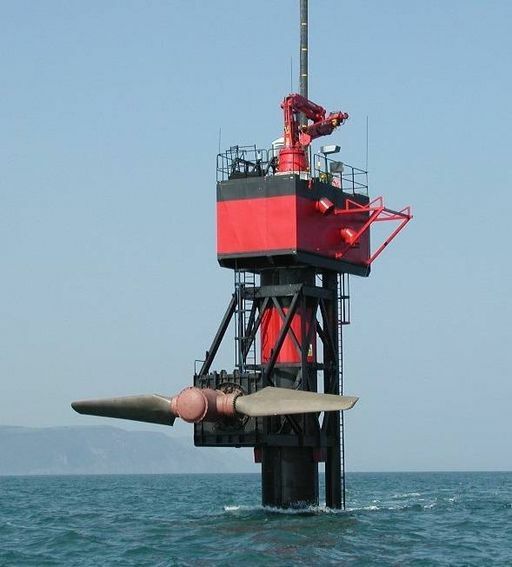 I have stumbled upon an Austrian startup offering floating turbines, designed for operations in larger rivers and delivering about 70kW at 3,3m/s flow velocity (Images on the German site). This is small compared to the overall kinetic energy of the Danube of about several MW, calculated from 2.000m3/s (mass flow near Vienna) and about 3m/s. 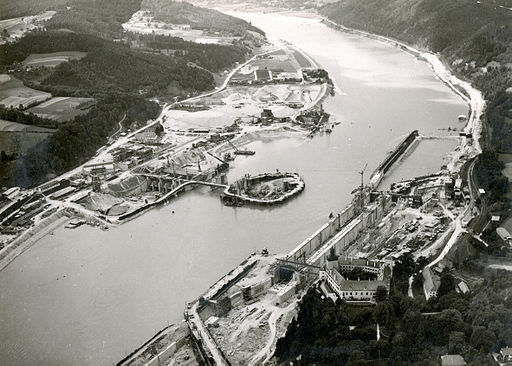 The first hydro power plant at the Danube in Austria, built in 1959 – an icon of post World War II reconstruction (Wikimedia). The plant is currently modernised, the rated power will be increased by 5% to 250MW. Utilized difference in height: 10m. So the whole kinetic energy – that cannot be extracted anyway – is still small compared to the rated power of typical power plants which are several 100MW! … which is much larger than realistic values of ! Typical usable kinetic energies are lower than typical potential energies. So if tunnel drain water should drive a turbine, the usable height is crucial. But expected powers are rather low compared to the heat power to be gained (several MW) so this is probably not economically feasible. This entry was posted in Physics, punktwissen, Science and Technology and tagged Classical Mechanics, Electrical Power, Energy, Engineering, Hydro Power, Mechanical Engineering, Physics in Everyday Life, Renewable Energy, Technology, Water Turbine by elkement. Bookmark the permalink. In Canada–and yes, here in NL–hydro is quite feasible. The present Churchill falls installation in NL does 5GW and there are plans to add 4 GW in two stages. I am always amazed, though, at the level of political interference that goes into the planning of these things. In our case, for example, getting the energy out of Labrador meant building a power corridor through Quebec. We never did come to proper terms, for a whole host of complicated reasons, and in the end would up selling it to Hydro Quebec for a few tenths of a cent/kWh. Amazing! That said, once in place a hydro facility should produce cheap energy for millenia. You’d.You’d really only need to keep the dame up in shape as the turbines and generators are constantly being maintained and upgraded anyway. From time to time, one assumes, major work would need to be done on the dame, though. It’s often not mentioned, though, the two kinds of pollution that can happen with hydro. First, when the land is flooded, besides the loss of habitat space there’s also a large release of CO2 as the living material decomposes. Second, there’s the issue of thermal pollution. Some of the potential/kinetic energy released by the falling water goes to raise the temp a bit and this can be a problem for fish both in terms of direct effects of the temperature as well as unwanted algae growth. 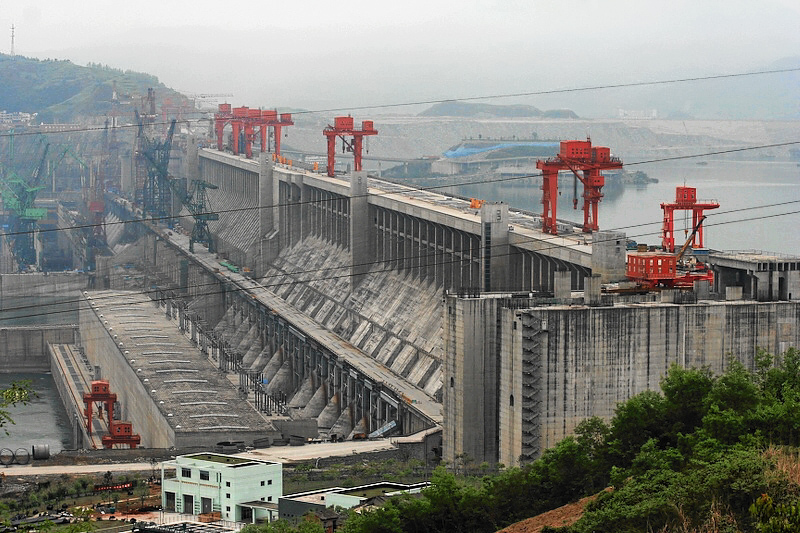 When I saw the picture of the dam in China I was reminded of a new problem faced by developing countries not necessarily related to hydro. It seems that many of the rivers in Asia now are completely tapped dry before they reach the sea owing to vastly increased demands for fresh water. Thanks for your comment, Maurice! Again it motivates me to do more research of energy generation in different countries. It is so interesting to learn what works and what does not work – often for non-technical reasons. In Austria we have plenty of hydro power, but the potential is also very well exploited. It is an interesting challenge for environmentalists: The Green Party in Austria was basically born out of a movement that prevented building the last “missing” large power plant at the Danube. That’s also a great way to compare gh und v^2/2 directly, thanks! But you mean 10m, not 300 liters, right? … as velocity only depends on height. The Snowy Mountains river scheme in Australia has a number of hydro-electric power plants. I used to live 20km from the Hume Dam power station which has a peak output capability of 58MW and was built in 1957 (before I was born). Putting the potential energy capacity into perspective, the water stored is 5 times that of Sydney Harbour! The huge Snowy mountain hydro scheme, built between 1949 – 1979, has a total power generation capability of 3.772GW! That’s 3772MW of peak power…. Compared to the single three gorges project in China, the Australian Snowy scheme (built ~50 years ago), dwarves the rest in both size and peak power output. Thanks a lot for your comment – absolutely impressive! But it seems in those lists such schemes as Snowy Mountain “get lost” and only individual plants are counted. Ha – I hoped somebody would ask about the cross-section 🙂 It seems you are an engineer at heart! I had a sentence in a previous version “Unfortunately this effect cannot be used to ‘generate’ additional energy”. I deleted it though as I found it difficult to explain briefly, and I would have opened another can of worms. What I have not mentioned is that there is actually a third “sort of energy” which is the pressure in the water. When the pipe gets narrower in some sort of funnel, the pressure gets smaller so that the total energy remains the same. I should probably not have called it a pipe, but I was thinking of an open riverbed (same pressure everywhere dictated by ambient air) and just speculating about how wide this natural pipe might probably be. I’ll a small remark. This subject is so far a field of my understanding or experience that I’m unable to say anything… except that you make a good teacher of complex things. 🙂 I think I’ve discovered some appreciation for hydro power. Thanks, Michelle! What I find fascinating is that we (incl. myself here) often have no well-developed intuition for numbers related to such tangible things – I am not speaking of quantum physics and the Higgs boson. I am always trying to keep those cross-checks in mind – but if I don’t work with some technology hands-on for a while or solve problems and calculate something, I forget it, too. But I try to optimize and re-learn all the time! So I thanks for commenting here – as I am never sure if such crude estimates and number games might be somewhat interesting. They are interesting. It’s like Dave’s posts that begin “do people know where food really comes from?” The answer isn’t the grocery store, just as the answer to the same question for energy isn’t “the furnace” or “the light switch.” It’s a healthy exercise to be reminded of even that simple fact!